To save time, please this page for answers to most commonly asked questions about ordering from our store. Click on the plus sign next to a question to view the answer. How much will an order (plus shipping) cost? Since the final cost depends on the features you need — size, color, attachment options, etc. — please add the item(s) you want to the shopping cart with your desired options. Our shopping cart will show you the cost of the item(s). Since shipping costs depend on your location, how quickly you need the order, and the combined shipping weight of items ordered, click on the “Calculate Shipping” button to see available shipping methods and costs. For information on shipping options and speeds, please refer to our Shipping Policies, Expedited Services, and International Delivery pages. The shopping cart will calculate and display the total cost for each item, available shipping options, and sales tax for shipments within California. NOTE: If the cart does not display shipping options, please make sure your zip code is correct. We do not offer discounts as every item is individually handmade and producing multiple items for one order does not decrease the amount of time and effort required to make each item. Yes, we can. Please see the Expedited Services page for more details. This depends on the item(s) you order. If you order a pre-made, ready-to-ship item, it typically ships out next business day. We ship Priority Mail within the United States, and most orders arrive 2-4 working days after shipping out. Please note that we often only have a handful of pre-made items, but we offer rush processing on made-to-order and custom items, so a custom Unicorn Horn can ship out in as quickly as 2 business days. Most orders fall under this category as our specialty is custom products that can be made to your choice of sizes and colors to match your horse’s coloring or your own costume. The standard processing time can vary from item to item. When adding an item to the shopping cart, you have the option of choosing an expedited custom service option if you need something shipped out faster than the standard processing time. If you ordered a custom item, your order confirmation will show the Custom Order Processing Option you selected when placing your order. Please note that the actual number of days you selected for your order may differ from the example pictured below. Since almost every order we receive is for an event or photo shoot, we do not offer free shipping. Our standard shipping method is USPS Priority Mail, which normally takes 2-3 working days to be delivered (Note: custom items must be made prior to shipping out). We also offer FedEx express shipping options for customers who need guaranteed delivery dates. Due to the amount of time and work it takes to make an item, we do not have many discounts. If paying by credit card, make sure you do not close your browser window or click away until you see an order confirmation. If paying with PayPal, you should have completed all steps of the PayPal payment process until PayPal gave you a confirmation and transaction ID. 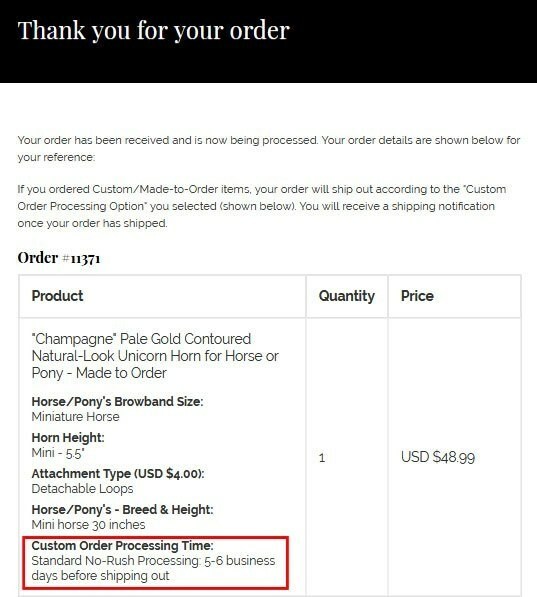 You should receive an order confirmation email from help@wishpony.com, and if you paid with PayPal, you should also have a payment receipt from PayPal.com. Please make sure you check your spam or junk mail folder for the confirmation. If you have received an order confirmation email, this means we have received your order. The most common reason for a card being declined is that you have made an error with the number, expiration, or security code. For security reasons, we also require that orders paid by credit/debit card be shipped to the billing address of the card being used. If you need your order shipped to an address other than the billing address (where you receive your statements), please select PayPal checkout which does not require a PayPal account and allows you to pay with credit/debit. If you have entered your shipping address and postal code correctly and your country is one that we ship to, you should be seeing at least 2-4 shipping options from the US Postal Service and/or FedEx. Shipping options and rates are retrieved directly from the US Postal Service and FedEx rate servers and not generated by our server. You have made an error in your postal code. This happens more frequently than you might think, especially on mobile devices, or if you copied & pasted the postal code and accidentally selected a space or missed a character/digit. You have entered an invalid address. Please check that you have entered the parts of your address in the correct fields. If you are located outside the USA, your country is on our list of ship-to countries and that you have selected the correct country from the dropdown menu. The USPS or FedEx servers could be experiencing a temporary technical issue on their end. If you are not seeing the express shipping options you need, please contact us for assistance. An order confirmation is automatically sent to your email address when an order is submitted by checking the “Terms of Sale” box and completing the payment. The confirmation email usually arrives within a few minutes, but some email providers may filter it as junk mail, so please check your spam/junk folder. One very common reason for not receiving an order confirmation and subsequent shipping notifications is that the email address was not entered correctly or you used different email addresses for our website and PayPal and you are checking the wrong email account. Tip: If you paid with PayPal, you will also receive a receipt from PayPal. If you still have not received your confirmation after waiting a half hour and checking your spam folder, please feel free to email us to check. The most common reason for an item not adding to the shopping cart is that a required selection was left out. Our custom products come with many options – color, size, attachment, emblem, custom order processing options, etc. – and if a required field was not completed, you will need to select the missing option before adding it to the cart. Shipping costs are determined by the item(s) and destination, so please add the item(s) you want to the shopping cart, then click the “Calculate Shipping” button on the shopping cart page. The shipping cost will be calculated based on your country and/or postal code. NOTE: Actual FedEx rates may differ after you enter your full shipping address on the checkout page due to rate differences between commercial and residential addresses. First, please note that custom and made-to-order items are made after you place your order, and the processing time will be according to the selection you make when adding an item to the shopping cart. We ship via the U.S. Postal Service and FedEx. International delivery via First Class Package International can vary from 1 week to 10 weeks. We recommend choosing Priority Mail Express International, which usually takes one week to be delivered abroad. For more information, please visit our International Shipping page. USPS shows Priority Mail Express 1-Day but my package hasn’t arrived? There is an unfortunate issue with USPS’s online tracking system that erroneously records a 1-day delivery guarantee on Express Mail Shipments. While this is accurate for areas close to us such as Los Angeles and parts of San Diego, this is usually an error for the rest of the country. As stated in our Shipping Policy page, Priority Mail Express normally takes 2 business days to be delivered to most zip codes. If the USPS tracking on your package says “1-day” it is an error unless you are located in the Los Angeles area where Express Mail 1-Day is available. We do apologize for any confusion, but it is well known that USPS is far from perfect. If you have any doubts about USPS, we also offer FedEx for urgent shipping needs. Please remember that if you ordered a custom item, it will ship out when we have finished making the item. The amount of time it takes an order to ship out depends on the Custom Order Processing Option you selected when adding your item(s) to the shopping cart. Please note that the actual number of days for your order depends on what you selected when placing your order and may not be the same as the processing time of the sample order shown in the above image. Shipping notification emails are sent from help@wishpony.com. To avoid having your shipping confirmation filtered to your spam folder, we recommend adding this email address to your contacts or safe senders list. We utilize ShipStation to manage our order shipping and emails, and depending on our email client or provider, emails sent via ShipStation may get flagged as spam, so please check your spam and/or junk folder regularly. (Note: Some email programs such as Thunderbird have both a “Spam” and a “Junk” folder). No, we do not offer personal pickup. We do, however, ship FedEx and USPS Priority Mail, both of which would probably only take 1 business day if you are located closely enough to contemplate making a drive. FedEx Same Day delivery may also be available. Please contact us with your postal code to see if Same Day Delivery is available to your area. Please note that custom/made-to-order items will still need to be made first. Rush custom order processing options are also available. Yes, we ship to over a dozen countries including Canada, the UK, Ireland, Australia, New Zealand and more. Please see our International Delivery page for more information. This is normal for newly processed shipping labels. We often process shipping labels the night before an order will ship out. You may receive a shipping notification email in the evening, late night, or early morning (we often work till 2-3 am California time), but the shipments don’t physically leave our location until noon or early afternoon. It can take some time for the online tracking data to be updated, so please check the tracking page later in the evening or the next day. Can you ship UPS or FedEx? Yes, we offer FedEx directly at checkout. Please note: you may need to enter your full shipping address on the checkout page in order to view options and rates to your address. If you are a film or TV company and prefer to have us ship using your corporation account number, we would be happy to do so. Just contact us to make arrangements. Yes, our checkout page is secured with SSL to prevent 3rd party eavesdropping while you checkout. Your payment will also be secure as both payment methods we offer (Credit/Debit and PayPal) are secured by our payment processors. Your card details are not revealed to us when you place an order and any stored card numbers are stored on our card processor’s secure server and not on our server. You can pay with an eCheck (via PayPal), however, we do not recommend it since eChecks take 4-5 business days to clear before your order can begin processing. This means it will take your order an additional 4-5 business days (on top of custom order processing time) to ship out. How do I measure my horse’s browband size? Ordering the correct browband size is important for your costume to look good, especially if you are ordering a browband. Measure your horse for the headstall you intend to use with the costume. The browband size may differ between halters and bridles depending on the slant of your halter’s crownpiece. WishPony browbands are measured from loop to loop. The easiest way to find out if a browband is your horse’s size is to measure a browband that already fits him/her. Alternatively, put the halter or bridle you intend to use with the Unicorn Browband™ on the horse and measure to and from the lower edges of the crownpiece. NOTE: If you wish to fasten your browband to halter rings, select the “Velcro Loops” option when ordering a custom browband. Natural-Look Unicorn Horns™ do not require a precise browband measurement; however, if you are ordering for an especially big or small horse/pony, we highly recommend selecting a browband measurement when ordering. Which Unicorn Horns are safe for use around Children? Wishpony.com specializes in soft unicorn horns that are safe for children and other people to pet or ride your unicorn horse or pony. With the exception of Rigid Horns designed exclusively for profesional adult equestrians, all our products are safe for use by children or on ponies who interact with children. However, it is your responsibility to order the right size, put on the product correctly, always supervise children and horses, and follow all standard safety rules. A soft horn does not change the normal risks assumed when working or playing with horses and ponies. Is the bridle included with the Unicorn Horn? No, listings for Unicorn horns are for one (1) horn. Headstalls (bridle or halter) used in conjunction with the horn in photos are NOT included with the horn. Are the flowers and/or butterflies included with the Unicorn horn? No, listings for unicorn horns are for the horn only. Flowers and butterflies are sold separately. Click here to order our new Friendly Butterflies. What’s the Difference Between a Natural-Look Unicorn Horn and a Unicorn Browband™? The Unicorn Browband™ is a Unicorn horn that comes on a browband in your choice of color and material. A Unicorn Browband™ is the most stable unicorn horn and suitable for active use such as trotting, cantering, galloping, jumping, rearing, etc. The Natural-Look Unicorn Horn™ comes on discreet straps to appear as if the horn grows out from your horse’s forehead. A full forelock helps to perfect the illusion. The Natural Look Unicorn Horn™ is intended only for calm activity such as photography, parades, walking, and pony rides. If your horse or pony tends to bob or shake its head when walking, a Unicorn Browband™ may also be better suited for it. Choose a browband color that matches your bridle or halter for the most realistic appearance. Is there a browband on a Natural-Look Unicorn Horn™? No. As the name suggests, the Natural-Look Unicorn Horn™ is intended to look natural and therefore comes with discreet attachments instead of a browband. 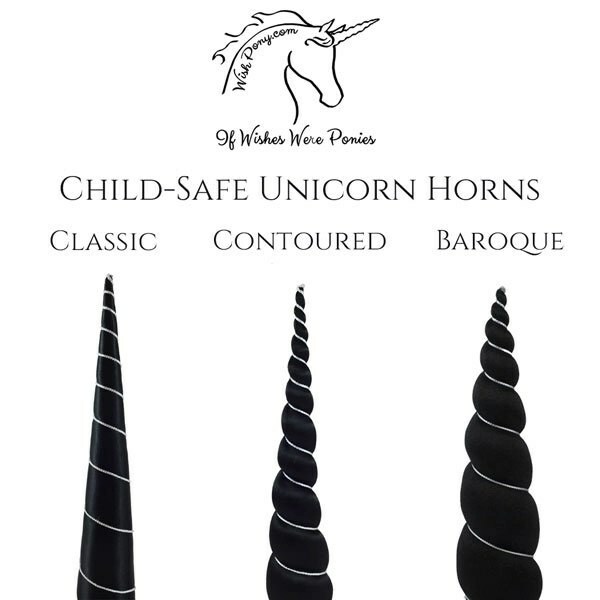 Should I order a Classic, Contoured & Baroque Unicorn Horn? We are constantly developing our designs and now offer 3 styles of Unicorn Horns for horses and ponies. The Classic Unicorn Horn™ is a more economical options for the casual user. The Classic is a conservative and simple horn style resembling depictions of Unicorns in early art and medieval tapestries. The Contoured Unicorn Horn™ is a more realistic and romantic 3-dimensional horn resembling a spiraled seashell. We recommend that all professional photographers order a Contoured horn due to its more artistic and attractive shape. The Baroque Unicorn™, while it can be worn by any breed, was designed for robust horses and ponies or those with large heads – e.g. Friesian, Gypsy Vanner, Andalusian, Lusitano, Highland Pony, Percheron, and any muscular or stout horse/pony. Which Unicorn horn product should I buy? We make several different styles of Unicorn products for varying purposes. The Natural-Look Unicorn Horn™ is our most popular product as it comes with discreet attachments that make it look as as if the Unicorn horn grows out of the horse or pony’s forehead. This product is the top choice for pony parties and professional photographers as well as parents buying horns for costume classes and birthday parties. Please note that this product is intended for light activity such as standing still for portraits or slow walking. If you plan to run or jump, then please purchase a Unicron Browband™. If your horse or pony bobs its head quite vigorously when walking briskly or has a tendency to shake its head a lot, we recommend going with a Unicorn Browband™. The Unicorn Browband™ was our original Unicorn product first launched in 2005. Unicorn Browbands can be made in a number of colors to match your horse’s coloring, bridle, or your costume, depending on the look you wish to achieve. If you wish for the browband to be as discreet as possible, we recommend ordering a Unicorn Browband™ that matches the color of your halter or bridle. The Unbridled Unicorn Horn™ was also designed for photography without a halter or bridle. This item attaches to the horse or pony’s forelock using a discreet hair clip. Please note that this item is intended for use with the horse standing still for a photo, and not for riding, doing tricks, or anything athletic. I am a photographer. Which Unicorn horn should I order? Our Natural-Look Unicorn Horn™ does not come on a browband but instead has thinner straps designed for a “natural” appearance. The Natural-Look attachments are virtually invisible on a light colored horse and barely visible dark horses viewed from a distance. The Unbridled Unicorn Horn™ was also designed for photography as the attachments are invisible. If photographing horses performing athletic activity (running, jumping, rearing), you should use the more stable The Unicorn Browband™. For professional photography and portraits, we highly recommend ordering a Contoured Natural-Look Unicorn Horn™. What Color Horn and/or Browband Should I Order? We offer many colors of horns and browbands (if applicable) so you can personalize your Unicorn Horn to suit your horse’s coloring or personality, match your tack or costume, or just to be different. You might think some of the unicorn horn colors we offer are outlandish and “un-unicorn-like”, but no one can say what color horns “real” unicorns are supposed to. As children, we loved playing with and watching My Little Ponies, which had a big influence on our horse craziness and started us on this career of costuming for horses and ponies (you can read more on our About Us page) and we therefore offer horns in all colors of the rainbow as tribute to our childhood playmates. Whether you are dressing your horse or pony as a My Little Pony or as a “real” unicorn, below are some recommendations on color choices for the effect you are trying to achieve with your Unicorn horns for horses and ponies. Champagne/Pale Gold – Good for white, ivory, cream, and other gold-toned horses – e.g. Cremello, Palomino, Bucksin, Dun, etc. Gold Horn – A classic look that will look good on pretty much any horse. Yellow Gold Horn – Good for white and yellow-toned shades of coats. Dark/Antique Gold – Good for white, yellow-toned, and brown horses. Pink/Dusty Rose Horn – Good for pale horses including white, cream, and gray, especially those with visible pink skin. Sky Blue Horn – Good for white and gray horses and ponies. Purple Horn – Good for white, gray, and black horses. Black Horn – For black horses or dark horses with black points or visible dark skin on the muzzle/ears. Tip: If using colorful horns, you can accessorize your horse with mane extensions and ribbons to add more color to balance out your ensemble. If ordering a Unicorn Browband™ instead of a Natural-Look Unicorn Horn™, we recommend ordering a browband color closest to your halter or bridle color. We offer an array of colors to match the many nylon halter and bridle colors popular in the market. Some customers like to order a browband to match the horse’s coat, but a browband loop that doesn’t match your bridle/halter makes the effect very costumey. When your unicorn browband is the same color as your horse’s tack (and the horn matches your horse’s coat/markings) it looks as if you procured a special browband with a hole to accommodate your unicorn’s own horn. Due to the wide range of sizes from Miniature to draft horses, you will need to measure your horse or pony to determine the correct size to order. If you need a browband measurement, please measure the browband from a bridle that fits your horse/pony to and from the ends of the loops. If ordering for use with a halter, please measure across the horse/pony’s forehead to and from the lower edge of the crownpiece. If you do not have access to the animal, please consider asking its owner for the measurements. If they cannot help you, we may be able to help you determine the correct item or size to order if you can provide us breed and/or height information. The Natural-Look Unicorn Horn™ is adjustable in fit, so it is a good choice when you don’t know the horse or pony’s size. Horn height is really a matter of taste. Unicorns have been depicted with a variety of horn sizes throughout history, so you should select a horn size that you personally think is realistic. It is our personal opinion that small horns are cute, but larger horns are more impressives. If you cannot decide, try holding a ruler (slowly and carefully) against your horse’s head to see which heigh best suits its head size. We recommend the following minimum horn sizes for best results. When in doubt, taller is better than too short. Following are average browband sizes for various horse types. While Natural-Look Unicorn Horns™ can be adjusted a couple of inches, we do recommend that you measure your horse or pony or its current browband to ensure best possible fit. Miniature Horse – Small Pony: 12 in. Cob or Small Horse: 15 in. Draft Horse: 18 – 22 in. Can I use a Unicorn horn on a foal? We have had a few inquiries about Unicorn Horns for newborn foals. Please note that a foal must be halter broken to wear a unicorn horn. We do not recommend putting costumes on young foals unless they can be calmly led and restrained with a halter and have completely docile personalities. If you think your foal may be spooked or upset by the experience, wait until it has more training and experience before dressing up as a unicorn. If you are ordering a Unicorn horn for a foal or immature horse, always order a child-safe Unicorn horn such as the Contoured Natural-Look Unicorn Horn™ and never order a rigid horn as you cannot predict how a green horse may behave. We do not have a print catalog as we are constantly adding to our selections with new colors, custom options, and trims. Are you selling Pegasus wings? We are currently working on a new and improved design for our Pegasus wings to make them more durable as well as easier to ship and store. During this time, we are not taking orders for Pegasus wings, and we do not anticipate them to be ready for the Halloween 2015 season. Why don’t you have more Ready-to-Ship Items? From the day we began selling our products, we were inundated with requests for the same items in a different size or color. Over the years, we have added many custom options to our products so our customers can order items to complement their horse or pony’s coloring or to match their own costumes. If you visit our site over a period of time, you may notice that some pre-made items are on the site for quite a while. This is because most customers prefer to order something customized. If you are looking to order something pre-made, please check our Pre-Made/Ready-to-Ship category which contains what pre-made items we’ve had time to make between custom orders. Our credit card processor uses 2 methods of verification when approving credit card charges on this site. If you do not recognize a charge from on your credit card statement, please ask your spouse, children, business associates, or anyone who has access to your card or is an authorized cardholder. We spend a lot of time hand-making each item that is ordered from this site and a disputed charge not only harms our business but takes away hours to days of work on our part. Before opening a dispute, please ask family members or colleagues if they have placed an order from our site and contact us if you need shipping and tracking details for the order in question.